When I started working at my current company, there was no UX team. Suddenly finding myself a team of one—I’d spent the previous year at a Global Fortune 500 company that employed multiple international UX teams—motivated me to immediately start building. I braved the new world of pioneering a solid UX foundation—and I succeeded. Within the past year, our team has shifted direction from designing feature requests, to leading major product initiatives based on research, testing, and data, to creating technology that’s been submitted for a patent approval. I’ve recently been asked about my approach to creating a healthy UX foundation at an organization. How do you go about establishing and growing a UX team, let alone a multidisciplinary enterprise UX team? You can’t just roll the dice, pass go, and collect $200. 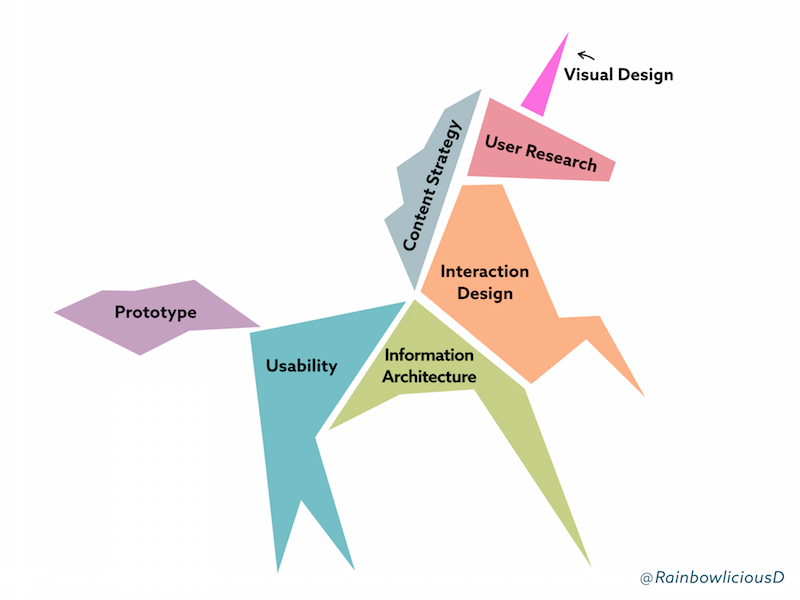 Building a team can be complex, so the best way to start is to understand the core disciplines that make up UX. If you’ve dipped your toes into the UX realm, you’ve probably seen examples of various UX disciplines. The difference with the roles I’m about to describe: they’re the areas our team has focused on to become one big unicorn of sparkles, glitter, joy—and most importantly knowledge. UX researchers define who our users are by examining their behaviors, activities, obligations, needs, and environment. They utilize these observations along with analytical data to identify user struggles inside and outside of the product and provide potential solutions to the team. Researchers reinforce the concept that user experience encompasses the holistic environment in which the user exists, not just the product. Focus: Who is our user and what is their environment? UX architects examine the content that needs to be delivered to users. They organize information and establish content hierarchy based on the user’s conceptual model, and how the information influences the user’s thought process and behaviors. Focus: How do users search and find content? Interaction designers map how users can easily move through a product to achieve their goals. They define clear pathways and establish consistent behaviors to help point users in the direction of success. They introduce animations as feedback indicators as the user travels down a product’s pathways. Focus: How do users move through a product or application? Visual designers build upon the initial design theories established by an interaction designer and apply typographical hierarchy, color, material patterns, and iconography. They establish how the smaller components or microinteractions fit together to formulate the overall visual appeal of a product. Focus: What is visually appealing to our users? 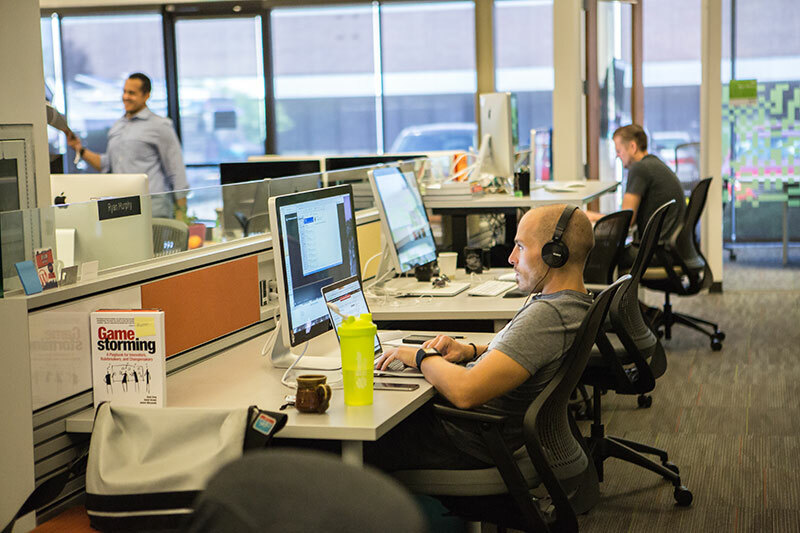 From Inside Design: Godaddy. Photo by Rick Rusing Photography. Prototypers may be disguised as UXers, engineers, or data scientists. They create a variety of interactive workflows with coded or non-coded prototypes to provide a proof of concept. They help the team understand if an interactive pattern effectively solves a problem or needs to be modified. Focus: How do we capture design ideas, bring them to life, and test their interactivity? Usability experts investigate whether a product’s pathways make sense to users. They identify where users get lost or confused via testing and provide feedback to the team to make necessary adjustments. Their findings help influence product revisions and future ideation. Focus: Is our product easy to use? Will customers use our product? Content strategists analyze the user’s language and understand how to speak to users in their own terms. They decide which content will be created, when it will be published, and how it will be exposed to the user. Content strategists set the product’s voice and determine the tone that will be used when addressing users in various situations. Focus: What language do our users speak? How can we talk to our users effectively? Our team didn’t start with all of these roles. We began with an interaction designer and a visual designer before addressing the need to bring on other roles. Sometimes you might not have enough team members for each person to take on an individual discipline—and that’s okay. Allowing individuals to cover one or more closely related roles helps improve the quality of your team. For instance, an interaction designer might also take on the role of an information architect and begin gathering the content hierarchy before diving into workflows and wireframes. A visual designer might conquer the prototyping role by setting up animations and clickthroughs within InVision. Wearing 2 hats versus 7 is always better —and the hats will eventually come off or transform as your team grows. 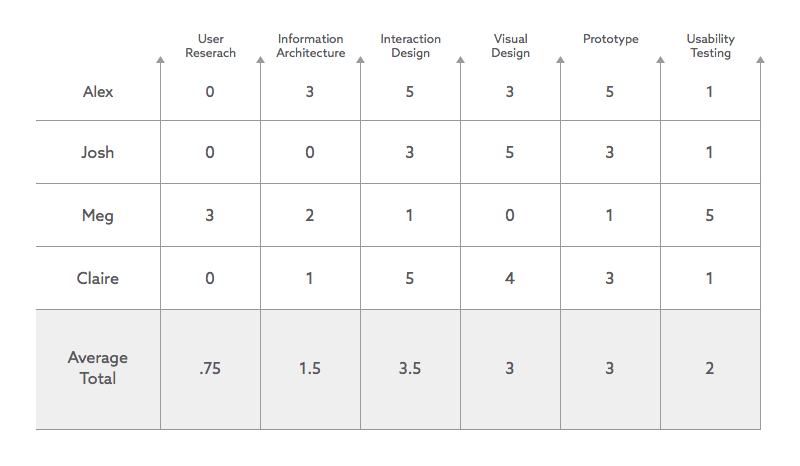 Before you start growing your team, assess your company’s current UX maturity. Do this by reviewing the various UX stages outlined by Jakob Nielsen (stage 1-4, stage 5-8) and understanding where your company’s progression resides and why. Understanding your company’s current state allows you to develop a future vision for growth. If your company is small, the likelihood of building a double-digit team in a few months isn’t great. Ultimately, you’ll need to choose wisely when selecting your next hire. Remember: just because your team is small, it doesn’t mean you need to hire 3 unicorns. Focus on diversifying your team to inspire knowledge sharing and improve efficiency. Take a step back to review your team’s successes and challenges. A solid team analysis documenting your overall UX strengths and weaknesses will allow you to gauge each discipline and identify gaps. 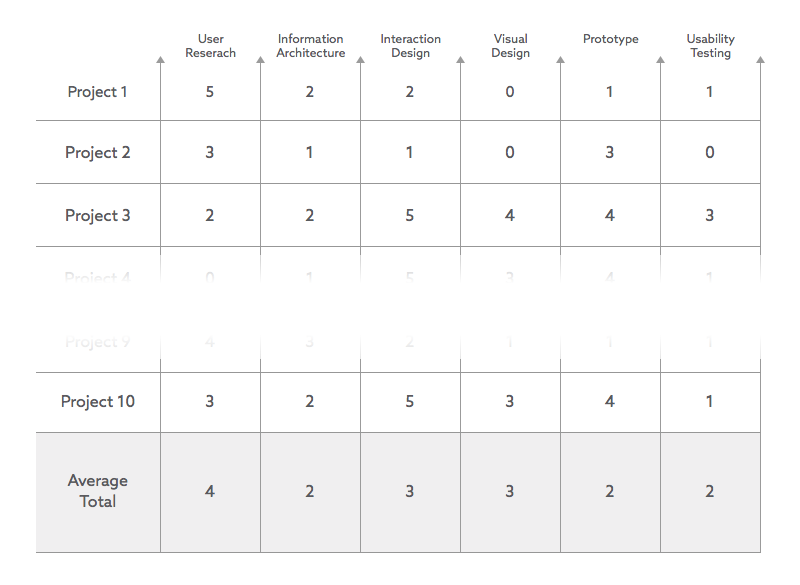 Your review should be based on the average total of individual team member’s competencies (1= low, 5=high) in the various UX roles compared to your team’s major projects. For example, if 7 out of 10 projects need heavy user research and your overall team skillset is a lower grade in this area, consider investing in a UX researcher as your next hire. Trust me, they’re worth the investment. It’s also important to figure out the gaps in your UX process. 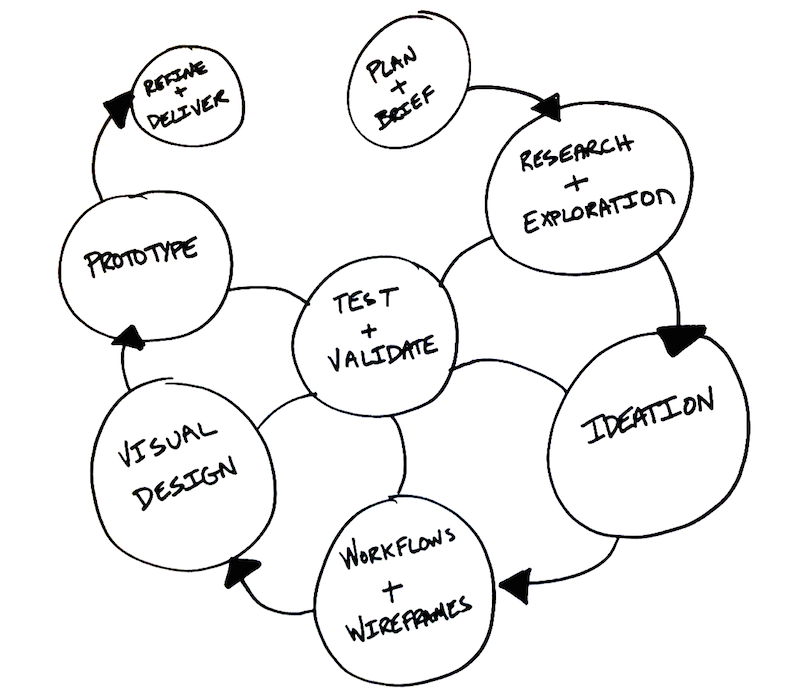 Our process takes care of this by putting testing at the center in order to influence designs and validate decisions. As our UX team multiplied, our process enabled us to switch from a part-time usability consultant to a full-time hire. The more you educate others about your UX process and overall vision, the easier it is to gain buy-in on growth for your team. Our UX team exposes the entire process from our initial research to ideation stages, all the way to final visual design, microinteractions, and prototypes. We capture everything from examples in other products to notebook sketches, to whiteboarding sessions to recorded snippets of animations and place those items into a shared InVision set that eventually includes everything up to final designs. We tell our stories in detail. Remember those disciplines we previously discussed? Not everyone in engineering, product management, and C-level understands the difference. Exposing those roles to other teams and management helps identify the varying workloads that a full enterprise UX team takes on. Plus, sharing your team’s process fosters cross-functional collaboration with external teams—and drives future ideation. Once you prove your team’s ability to positively change products, improve experiences, and gain adoption, you’ll have the power to grow. Seek out individuals who will be welcomed with open arms and will inspire your team to think big. This doesn’t mean you need to hire some bigshot who will come in and bulldoze everyone else’s ideas. Great UX teams are built from true collaborators who know when to take a step back and allow their teammate’s strengths to shine. Always keep in mind who your next hire might be. Whether you’re just starting to grow a team or you’ve built a UX dynasty, my ultimate advice is: hire individuals driven to inspire others. Energize your UX. Over her long career, Rachel has worked at companies large and small, producing award-winning designs, growing collaborative teams, providing ongoing training, and crafting user experiences for a variety of products and applications. She has been influential in the UX community through sharing her knowledge at both international and local conferences, including UX Scotland, Interaction South America, Big Design, Grace Hopper, The UX Lab NYC, and Ladies That UX. When not producing high-caliber designs or mentoring team members, Rachel looks for every opportunity to travel the world. Follow her ideas, topics, and travels on Twitter: @RainbowliciousD.